September 14, 15, 16, 17 [+Mat] 1988. 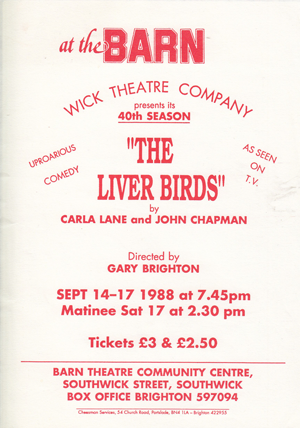 GB wrote: “For the start of our 40th Season, The Liver Birds is an excellent choice. An amusing play bordering on farce, well known to T.V. viewers as a popular series. John Chapman has sent his best wishes together with the original 1974 Play Poster and Mollie Sugden has kindly loaned us photographs from the Blackpool production along with her good wishes. This is my first time as Director for Wick Theatre company and I should like to thank all the cast for their hard work and all others who have assisted in making this production possible. May you all have a ‘fun’ evening and please keep supporting the ‘BARN’ Productions. ” WICK THEATRE COMPANY has reached its 40th year and now has a membership of over 100. The expertise developed over the years and the many successes are matters of which to be justly proud and as we celebrate our 40th Season it seems appropriate to indulge in a nostalgic recall of our early days. In 1948 a group of young people attended a lecture on the theatre given at Fishersgate by Mrs. Elizabeth Penney. The interest created was so great that a company was formed called the Unity Players with ‘Molly’ Penney as President. After 18 months of training only one dramatic work was performed before the company changed its name to the Young Wick Players. The Young Wick met weekly for many years at the home of its foundress in Church Lane, Southwick and their activities alternated between their two homes – the ‘Penneys’ and the Community Centre. The Barn Theatre was opened in 1951 and the group performed at the opening and have presented their plays there ever since. Of the original members only Ralph and Betty Dawes are still active in the company which again changed its name to the Wick Theatre Company during the 1962/3 season, when it was becoming evident the description ‘young’ was hardly appropriate when the age range stretched from 13 – 50. In the fifties sets were made and stored in Penney’s yard. Coal dust was a problem but we got by. Sunday mornings painting the set in the yard were great occasions, followed by tea and wads in the local cafe. In 1960 John Perrett was making ‘flats’ in his own garage. Captain Carvallo had a magnificent set and this led to a whole series of settings of the highest quality. By 1967 Vincent Joyce was designing and constructing sets for such plays as The Crucible and The Poker Session. His most memorable set was for The Night of the Iguana, but by this time we had acquired the workshop attached to the Community Centre which we share with Southwick Opera. Not only did our expertise in settings improve but also the quality of the wardrobe and properties, particularly for costume plays. This was due in no small part to Bess Blagden who directed such memorable plays as The Queen and the Welshman and The Queen and the Rebels and made properties of authentic style to add to the effect. As we became more experienced in drama so we felt competent to spread our wings and try the wider range of musical plays. Having presented revues under Ian Elliott’s direction in 1962 and 1963 we finally launched ourselves into the musical field in 1970 with George Porter’s production of Oh! What a Lovely War and there-after successfully presented Salad Days, The Boy Friend directed by Barrie Bowen and My Fair Lady directed by Jean Porter. These musicals have been a great boost to the company and are immensely popular with Wick and the public alike. THE CAST of Wick Theatre Company will have more than their audience to impress when they take to the stage next week. For their latest production, The Liver Birds, has been entered for the Brighton and Hove Arts Council full-length drama competition and judges will be taking a keen look at their performance. Last year they won the best set award – but are hoping for even better this time round. The play was written by Carla Lane and John Chapman and was the fore-runner to the long-running TV series of the same name. Actress Mollie Sugden, who starred at the premiere at the Winter Gardens, Blackpool in 1974, has written to the company to wish them luck. Liverpool and Everton Football clubs have also dropped in momentos [sic] to give an authentic Merseyside feel. Starting at the Barn Theatre, Southwick, next Wednesday [September 14], The Liver Birds is directed Gary Brighton and, for those not familiar with the story, tells the tale of two single girls living together in Liverpool. The girls, Beryl and Sandra, are played by Wick regulars Karen Butcher and Trudy Nash, who have been avidly watching TV’s Bread to help their accents along. It also stars Judith Atkinson in Mollie Sugden’s rôle, Joan Bearman as Beryl’s mother, Phillip O’Brien as Paul and Peter Joyce as Robert, plus other company members. There are five performances in total, including a Saturday afternoon matinée and tickets range from £2.50 and £3. They are available at the Barn Box Office on Brighton 597094. He did six seasons at the Westminster Theatre with Give A Dog and Bone and other plays and toured in four musicals, including Bless the Bride, which he directed for Southwick Opera earlier this year. He has film credits including Roman Polanski’s Dance of the Vampires and Oliver, and has also appeared on TV. Then, 18 years ago, he decided to get out of professional theatre and set up in business in the less frantic line of garden plants and conservatories. “I got to the stage when I was doing certain things and wasn’t sure I wanted to do them.” said Gary “So I did nothing for five years and then the urge came again.” This time he concentrated his efforts on amateur shows, starting with Brighton Operatic Society, moving then to groups in Worthing, Lancing and eventually Southwick. Therapeutic or not, Gary, who lives in Brighton, spends every moment of his spare time working towards one production or another. Before The Liver Birds even starts next week, he is already working with the Southwick Opera team for their next season’s show, Kiss Me Kate. He is also working on a Salute to Irving Berlin, a tribute to the composer’s 100th birthday and to help raise cash for the Barn Improvement Fund, at the Barn October 25 and 26. If that isn’t enough, there is always The Witness, a religious musical based on Peter’s life of Christ, to look forward to. As giggles and belly-laughs spread their way around the Barn theatre last Wednesday, it was evident the Wick Theatre Company had scored yet another hit. Working with the very funny and brilliantly written dialogue of Carla Lane and John Chapman in The Liver Birds, there were two outstanding performances which undoubtedly held the play together. Trudy Nash shone as she evidently enjoyed her rôle as Beryl, the single Liverpudlian girl with the ‘promise’ of breakfast with the man she was in love with. And with an equally well-matched performance by Karen Butcher as her friend and flat-mate, Sandra, the whole thing worked. The two girls kept very convincing Liverpudlian accents throughout the show, which was vital to a script hinging on Merseyside humour. And while the other characters’ voices admittedly ranged from North Yorkshire to Sloane London, it didn’t matter at all. Judith Atkinson was both impressive and very funny as Sandra’s snooty mother, Mrs. Hutchinson, and she was given as good as she gave from her ‘common’ counterpart, Mrs. Hennessey, played by Joan Bearman. George Illman as Desmond Duval provided an entertaining aside as the camp caretaker, who managed to pop in to borrow something just at the right moments. Peter Joyce smarmed well as Beryl’s enthusiastic boyfriend, Robert, and when the farce element came towards the end, all the characters succeeded with an impressive degree of timing and skill. A simple, but particular to the last detail, set from the design and construction team provided a perfect stage for the cast to work. In all Gary Brighton’s production came together well on the day and as the first show in the Wick’s 40th season, may they continue to have 40 more. BD had opened this Newsletter recounting a brief few days away in Yorkshire and news of a very poorly Jon Peaty. “Liver Birds – We returned home just in time to see the Sat. evening performance and how pleased we were that we did. I thought it was a superb production – and we’ll remember for a long time Trudy’s entrance with the cucumber on her eyes!!!! !